Build what you Play, Play what you Love! Great for new and experienced builders, this kit comes with everything necessary to build your very own 3-string Fretted Cigar Box Guitar. Fretted neck, hardware, cigar box, complete instructions: it's all in there. Cigar Box Guitars are a perfect example that making your own music doesn't have to be expensive or complicated. With this kit, this beautiful and highly customizable instrument can be built using nothing but simple hand tools and a smile. You get all the hardware, strings, cigar box and one of our fully fretted 25" scale necks! What tools do you need for the basic kit? You will only need a saw, screwdriver and a drill. You won't need a dedicated woodshop or expensive tools. Each kit includes a 26-page, easy to follow guide chock full of detailed photos and instructions. We designed this kit for the beginning woodworker. 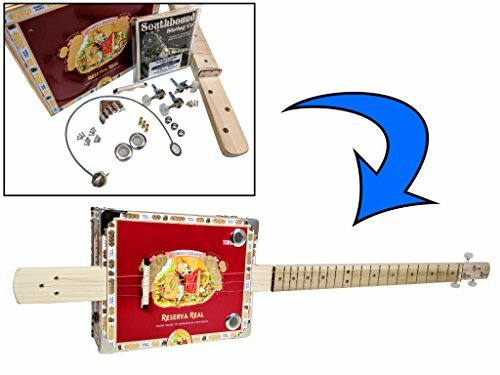 If you're looking for an even simpler kit, check out our Pure & Simple Cigar Box Guitar that you can assemble with only a screwdriver! If you have any questions about this product by C. B. Gitty, contact us by completing and submitting the form below. If you are looking for a specif part number, please include it with your message.